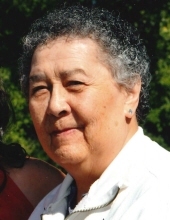 Erma D. (Hill) Danforth, 86, Oneida, passed away surrounded by her family in the evening hours of March 21, 2019. The daughter of Robert and Melinda (Parkhurst) Hill was born on January 22, 1933. On September 10, 1949, Erma married William “Bill” Danforth. Together, they raised thirteen children together. Erma was an owner and operator at Danforth Bar and The White Eagle. She also worked at the Radisson, Oneida Retail and in the kitchen at the Oneida Nation School. Erma was a devoted wife, mom, grandma, great-grandma, great-great grandma, sister, auntie, Dodo, and friend. She enjoyed spending time watching the Packers, Badgers and golfing. She collected turtles and angels, and enjoyed watching/feeding birds and traveling/site-seeing. She treasured her time spent at get togethers with family, was loyal to family sporting events, and was a woman of truth and honor. Her heart was filled with the joyous sounds of family laughter and music. She was so happy that she was able to be in her home, rather than in a nursing home. Erma is survived by her children, Jackie Danforth, Tommy (Karen John) Danforth, Carmen Danforth, Erwin (Marsha) Danforth, Ingrid (Mike) King, Paul (Tina) Danforth, Kerry "Buggs" (Candace) Danforth, Grace Delgado, and Melinda K. Danforth; grandchildren, Stephen, Stacie, Alicia, Timothy, Tonya, Billy Jack, Jeremiah, Tabitha, Lemuel, Darnell, Cheryl, Abby, Cheyenne, Nathan, Sara, Jennifer, Mike Jr., Gerald “Taco,” Connie, Lora, Cole, Nona, Olivia, Tia, Jackson, Jermaine, Evander, Evan and Billie; 59 great-grandchildren and 2 great-great-grandchildren. She is further survived by siblings-in-law: Betty Skenandore, MaryAnn Kruckeberg, Patsy (Harvey) Skenandore, Geno (Pat) Danforth, Dorothy Danforth, Marilyn Danforth, Shirley Hill, and Beverly Hill; and many nieces, nephews, cousins, all of her family in-law, and friends. She was preceded in death by her husband, William "Bill" Danforth, Sr., sons, Billy, Jerry, Wayne "Wayneo", and Stephen Danforth; daughter Mary; parents, Robert and Melinda; grandfather Flannigan “Kay” Hill; brothers, Erwin (Helga), Fredmond “Fritz” and Edward; her grandchildren, Angel and Gerrid; great-granddaughter, Mariah; parents-in-law, Pete (Sabie) Danforth; and siblings-in-law: Peter Danforth, Yvonne (Frank) Skenandore, Tony Danforth, Reggie Danforth, Cliffy Danforth, Reggy Denny, Al Kruckeberg, Tony Skenandore Sr., and Jerry Delgado; as well as many extended family members and family members in-law. Family and friends may visit at Ryan Funeral Home, 305 N. Tenth Street, De Pere, beginning at 9:00 a.m. on Tuesday, March 26, 2019. A prayer service will begin at 11:00 a.m. with Deacon Deborah Heckel officiating. Burial will follow at Oneida Sacred Burial Grounds. The family would like to thank St. Vincent Hospital and Unity Hospice for the care. They would also like to thank Dr. Michael Flood, Nurse Louetta Fowler and Erma’s granddaughter Billie. To send flowers or a remembrance gift to the family of Erma D. Danforth, please visit our Tribute Store. "Email Address" would like to share the life celebration of Erma D. Danforth. Click on the "link" to go to share a favorite memory or leave a condolence message for the family.